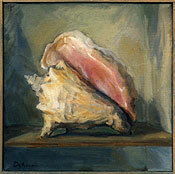 During January, a group of Ralph DeAnna's oil paintings was on view at Brooks Memorial Library in downtown Brattleboro. 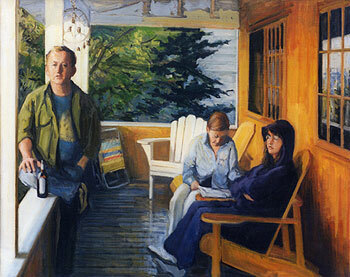 The paintings selected for the exhibit followed a theme described by DeAnna as "about summer." More specifically, however, they invoked the things of summer we long for, now, in the dead of frozen winter, such as heat, the beach, bare feet and warm, lazy afternoons. There in the library, amidst fiction and fantasy, the paintings seemed like chapters in a story about a long summer vacation, its characters being introduced chapter by chapter. This theme, however, is not specifically indicative of DeAnna's work, nor is his range of subjects limited to any such theme. These paintings, which are "mostly images of family and friends on vacation," are based largely on photographs taken around the artist's back yard or at the beach. It seems that in selecting these works from his studio, Ralph is sharing a bit of his longing for such a season. They do also rather well define his focus now, in his work, on the figure in the landscape, or as he puts it in his artist's statement: "people in the context of their surroundings." DeAnna was born in New York City, into a family of artists. His father and three brothers were all painters and no doubt provided rare inspiration and some friendly competition. Deciding in high school to take art seriously, he moved on through the Philadelphia College of Art, the Pennsylvania Academy of Fine Arts (earning a degree), and the Corcoran School of Art. After finishing formal training, he continued his study while working at the Library of Congress in Washington, D.C., taking classes in painting and drawing. (In documenting the artist's studious development, in fact, one can imagine a wealth of material for a potential biographer when provided with a list of his mentors.) 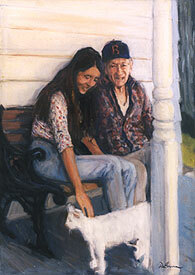 Moving to Brattleboro in 1988, DeAnna was a charter member of the Windham Art Gallery, organized the following year. He has facilitated the Wednesday evening open drawing sessions held at the cooperative gallery since 1990. Ralph DeAnna defines himself as a "realist." These days this term has lost a lot of its punch. At one time it was an easy thing to say that an artwork was either "abstract" or "realist." Now the lines between the two are gone and claims of realism are made by artists with all sorts of approaches: "This is my realism." Some say that all painting or picture-making outside of photography is abstraction of one nature or another: "You can't make nature." DeAnna has, however, fairly specific parameters to his definition of what being a realist entails. "In addition to mastering techniques of painting and drawing, the most challenging aspect of being a realist is the search for subject matter," says the artist. On a philosophical level, when interviewed, he was more pointed, explaining that a realist should "find meaning in everyday existence." He sees a parallel between his integrating a figure with the landscape and man's attempt to harmonize with nature, an ongoing struggle defining our innate condition. DeAnna has accomplished his search for subject by looking as closely as his own back yard and at people who are familiar and part of his daily life. These subjects sit or stand calmly, conversing or occupied with restful pursuits. Warm afternoon sunshine lights many of these unembellished themes. Since his early studies, the artist has used photographs for reference in his painting. Many of the figures share an ease and naturalness of attitude that would be hard to capture through observation. They are not posed so much as they are caught, though they are not wriggling too hard to escape: a friend sits calmly, smiling on a truck tailgate; neighbors relax on the porch; his partner, Judy, stands gently pushing a child on a swing. In depicting his subjects, Ralph does not allow the oil paint's expressive quality to be a subject in itself; rather he restricts the paint's significance to its use in imitating the textures of cloth, flesh, water, etc. and to rendering movement and light. Invoking the artists Corbet, Manet, and Degas as realist predecessors, he has placed himself quite firmly in the tradition of artists -- that is, American artists -- who hold on to a pre-Impressionist idea of what art is, while allowing their brush to be selectively influenced by the many approaches to painting breached by explorative artists over the last century and a quarter. DeAnna also mentions Picasso as an inspiration, but he is probably not talking about Cubism; even the Blue and Rose periods would seem to break the rules of checking expression in favor of rendition. It is within that rendition and in its arrangement that DeAnna's inventive and expressive projections occur, those being mostly narrative and descriptive. 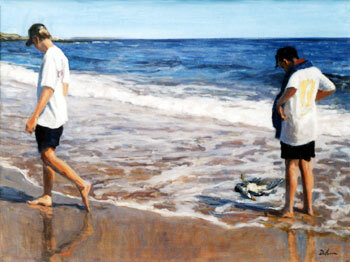 A 24- by 32-inch painting entitled "Dead Seagull" shows two young boys taking an explorative stroll on the beach. Both are in baseball caps, white T-shirts and dark shorts. With eyes cast down, the two are making that timeless meander that comes after a day in the surf, when the meeting of sand and sea becomes an open treasure chest of potential wonders. The younger of the two stands at the right side of the composition, hands on hips, all attention focussed on the dead gull, washed up by the tide, at his feet. His posture communicates both curiosity and revulsion, as he studies the flightless, feathered corpse of that which once soared high in the sunlight, now compromised by death and disheveled in the surf. Ralph reminds us that this strip where worlds of ocean and land meet is a hatchery, hunting ground and cemetery, where exotic forms of life thrive and husks of its debris dry and bleach in the sun. Ahead of the youngster at the left side of the beach scene, a slightly older boy, one would assume a sibling, has passed the gull. He is a few paces onward, looking for further wonders on the glassy, reflective, freshly washed sand, from the depths of mystery, the rolling blue sea. This painting has the coincidental and casual authenticity of a snapshot in appearance and the freshness of a watercolor in treatment, though it is oil. DeAnna mixes his colors to accurately reflect the effects of sunlight. His signature in paint is what results from a strong knowledge of materials and technique being applied quickly and directly, each decision reflecting the years spent studying the figure, exacting his values and fine-tuning his compositions. In order to fulfill his definition of realism, all visual description must be beyond question so that the viewer can get past the technique to appreciate the narrative and its subtleties, the effects of light and the psychological states of the figures depicted. Paint is his facilitator rather than a means to an end in itself. Another recent showing by the artist at the Riverview Resturant featured a group of flower studies, small compositions recalling Manet's obsession with the subject. It was the brushy looseness of such still-lifes by the last major pre-Impressionist which inspired Pissarro and other Impressionists to create their revolution of expressive brushwork and a true capturing of the visual effects of light. But in spite of a resistance to painterly expression in itself, DeAnna's technique is beyond posturing, and the depiction of light and arrangement of color is very considered, subtle and in spots almost juicy. The efficiency of technique is somehow reassuring to the viewer, as if this is something they don't have to interpret aesthetically. Unchallenged by painting "theory," they just get to discover the story or narrative told by the picture, that narrative being full of life observations and details which enticed the painter's eye. A poet like this painter would smile at Rimbaud, shudder at Bukowski and get back to Shakespeare without a second thought. It is no wonder that we believe Ralph's figures as easily as we do. As weekly organizer of the figure-drawing sessions offered on Wednesday evenings for 14 years now, he has probably logged more hours in worship of the human form than most Brattleboro artists added together. That weekly meeting of artists is one of the elements of the downtown art scene, which provides real grounding and authenticity to Brattleboro's arts community. Ralph is quick to point out that while the sessions are open to walk-ins, he keeps an eye on participants, making sure they are serious, so as not to compromise the integrity of an important artists' resource. At the session, "natural" poses are preferred over set-up or allegorical poses, and the same models often return, creating a familiar and clubby atmosphere. The artists often gather at McNiell's brewpub after straining their eyes, hands and minds in study of the human form, carrying on more than one tradition handed down since the Greeks. Truly, DeAnna has defined and mastered his ideals in painting. The question of why he has not explored larger-scale compositions seems inevitable. Also, his mastery of the figure invites narratives that might be less busy in detail but more subtle in psychological and physical description. After all, there are not many artists who have spent the time to learn to do what Ralph DeAnna can do, and these unexplored areas are obviously within his grasp. When something's good, we always ask for more. That is, more observations of everyday life, here and now, in a small town, by a quiet and studious painter, who loves his craft and shows it. Editor's Note: Landscapes and garden florals by Ralph DeAnna are displayed at Friends of the Sun, 532 Putney Rd., Brattleboro, throughout February. Scot Borofsky is a writer and painter living in Brattleboro.